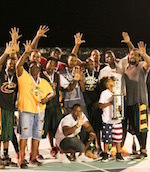 Shottaz have clinched the regular season title at the Anguilla Amateur Basketball Association. They toppled Outlaws 82:44 to finish on top of the ladder at 12-0 record. Jason Hodge (201-F, college: Oklah. Panhandle St.) stepped up with 29 points to pace Shottaz. Colin Harrigan (183-G, college: Clinton CC, IA) and Khalid Brooks added 17 points each for the winners. Outlaws answered with 20 points from Wendell Herbert. Shottaz will now take on Knights in the semifinal clash. Hoyas will face Raiders for another ticket into Final.